Dining al fresco – the art of eating outdoors is a pleasure that combines casual atmosphere, fresh air, cool breezes and great food and beverage. The venue can range from family style BBQ and picnic tables or even your car at places like BBQ King on Wilkinson Blvd. or Brooks Sandwich House on North Brevard Street to a setting with comfy patio furniture seating at places such as Osso Restaurant and Lounge at the Music Factory and Bonterra Dining and Wine Room in Dilworth. Lots of restaurants with patios offer opportunities for dining al fresco throughout the year, but late spring, summer and on into early fall is the time we want to enjoy the out of doors as much as we can. So lap up the sunshine or sit in the cool comfort of the summer shade. Join your kids in a game of shuffleboard at the patio at Zada Jane’s in Plaza Midwood while you wait for a table at breakfast or brunch; take in the splendor of our city’s skyline from the highest heights atop the patio at Chef Rocco Whalen’s Fahrenheit Restaurant at the Hyatt Place Hotel uptown; or enjoy food, wine and occasional music at several eateries or wine shops with outdoor dining and tastings such as Napa on Providence in Eastover; and Vin Masters in SouthEnd. Great patios to see and be seen abound at local breweries in NoDa; bars and restaurants surrounding the Music Factory; and in shopping “villages” around town where several restaurants might have patios grouped together off a main courtyard as at Ballantyne Village where patios from Mellow Mushroom, Terrace Cafe and Villa Antonio meet; or off South Main Street in Davidson where the back porch patio of the Pickled Peach looks over the patio behind Summit Coffee nestled up to an adjacent playground – on Saturday mornings this “common area” is home to the Davidson Farmers’ market where locavores can enjoy combine their morning coffee al fresco with a little fresh from the farm shopping trip. Tis the season, indeed, and so my June restaurant segment on WCNC’s Charlotte Today with hosts Colleen Odegaard and Ramona Holloway features five of my favorite places to dine al fresco with some of my favorite summer menu selections as well… enjoy! We’ll start with what I have always thought to be one of the most romantic patios in town, Toscana, located in Shops on the Park across from SouthPark, 6401 Morrison Blvd. 704.367.1808. Like all of Augusto Conte’s magical restaurants, the menu at Toscana offer high quality fresh made Italian fare and the patio is like sitting off a small village side street in Tuscany. Comfortable seating surrounded by a shrub lined fencing keeps it tight and cozy, A beautiful fountain offers the cool comfort and pleasant sounds of a water feature and large pots of herbs define the heritage. In the evenings the open sky view add the romance of moonlight and the stars. One of our favorite dishes at Toscana is the gnocchi, tender potato pillows bathed in a light fresh tomato sauce touched with basil and mozzarella – add a bottle from the well appointed wine list – perfecto! Not far from Toscana, is Wolfgang Puck’s Pizza bar located in the Phillips Place shopping center 704.295.0101 Charlotte’s WP Pizza Bar is Puck’s flagship Pizza Bar Restaurant and offers a relaxing getaway from to enjoy lunch and dinner. The patio is off to the side of the restaurant, away from parking and much foot traffic and offers a cozy comfortable place to great place to getaway from it all. Perfect for business meetings, ladies who lunch or a midday tete-a-tete. While the menu offers an assortment of appetizers and pasta dishes, for me this place is about the pizza done in Wolfgang’s signature style a la an aromatic wood burning oven. While Wolfgang himself does occasionally make appearances at the restaurant, day to day it is the talented Chef Scott Whallen and staff who channel Puck’s vision and creative juices into beautiful and delicious plates for lunch and dinner. We now enjoy WP as our go to after the movies spot and our go to order is the arugula and asparagus salad lightly dusted with grated Parmesan, teamed with any one of the lists of pizzas – our current faves are the mushroom pizza with rubiola cheese and the slightest drizzling of truffle oil and the margarita pizza – simply perfect for the two of us to share. Next, Tupelo Honey at 1820 South Blvd. 980-225-9167. The restaurant and patio are located on the second level of the historic SouthEnd Building, take the stairs or the elevator up and the fun begins. The restaurant is full of action and a buzz most of the time, so the patio offers a lovely slightly quieter dining option. Great for families or dinners for two, big overhead fans keep the climate cool and in case of inclement weather their are outdoor curtains drawn to keep the rain away. The vibe at Tupelo is reconstructed Southern and it is exceptionally well done from soup to nuts. Great service and an assortment of wonderful craft cocktails and local beers round out the experience. Must tries this season include the sweet potato pancakes ( breakfast is served whenever you want it at Tupelo), the black bean burger and tofu wings (three cheers for some great vegetarian options), the fabulous Southern Popcorn ( aka fried okra) and the Carolina Mountain Trout with Goat cheese grits – shooo mercy! and Tupelo’s own Brown Butter Pecan Pie. Look for bar specials on Monday, Tuesday and Wednesday ( the least crowded days and nights to dine at this Charlotte favorite); and while you are there shop for cookbooks, Tupelo’s biscuit mix and of course, jars of Tupelo Honey. The Summit Room at 1531 East Blvd. 980.237.2227 is one of Charlotte’s newest places to dine al fresco. In a clever and creative move, The Summit Room owners also own the adjacent restaurant The MayoBird and the two dining establishments share this picturesque porch and patio. The MayoBird is open for breakfast and lunch, while The Summit Room with Chef Brent Martin at the helm in the kitchen is open from early afternoon till the wee hours of the evening. Several years ago the Dilworth Communtiy made it a mission to drive neighborhood foot traffic with more pedestrian friendly streetside dining. As a result, many neighborhood places on the boulevard offer patio dining but not many do it better than this. Rocking chairs with side tables on the porch, patio tables in the sun or under umbrellas – its a great place for everything from power lunches to a glass of wine or tea – with two very different dining concepts. At The Summit Room, Chef Martin doing some really innovative things with the menu. Love that the menu changes at his whim, with the weather and with the availability of local product. Specials are always great – the hand cut fries are incredible and my new favorite – a quenelle (or oval shaped scoop) of chicken liver mousse atop a house made waffle with candied and pickled fruit and microgreens is a real winner! Finally, the newest patio on our list for today, at just a month old, is to be found in the unlikeliest of locations: the center of the Park Road Shopping Center parking lot! This free standing building with the little patio offers big flavors inside –flavors like homemade, almond, pistachio, coffee bean, chocolate hazelnut, lemon ricotto, local strawberry and blueberry and pineapple and mango! 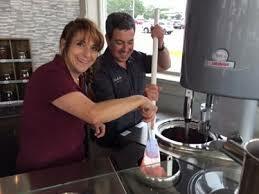 It’s all in the guise of homemade gelato at Va da Vie Gelato, 4203 Park Road 980.201.9159 … owners John and Wendy Paglia use all local product to make their Piedmontese style gelato and sorbet. No bases or mixes just local Homeland Dairy milk and cream and real fruit, fair trade coffee, local cheese and imported Italian nuts – no chemicals or preservatives. As this product doesn’t travel well – you can’t really take quantities to go – just gotta eat it there and savor the moment. During the heat of the day enjoy the cool marble-lined comfort inside; and in the evening mix and mingle on the patio with friends and neighbors of all ages, comparing flavors and deciding which one you will order next. 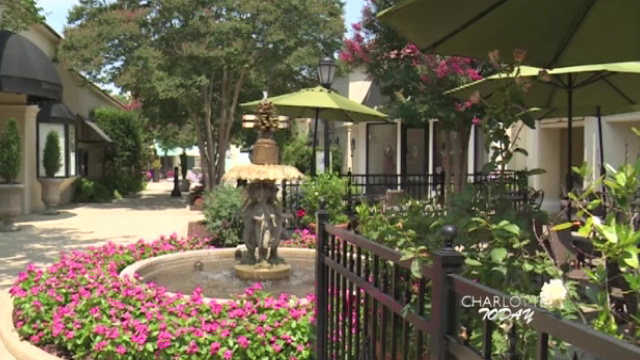 To watch the restaurant segment that inspired this blog post and originally aired on WCNC-TV’s Charlotte Today, simply click on the caption of the photo of Toscana’s beautiful Italian Patio, then go out and enjoy al fresco dining in Charlotte for yourself. I would love to contact you regarding a potential restaurant review opportunity. Would you mind providing your email? Thanks so much!